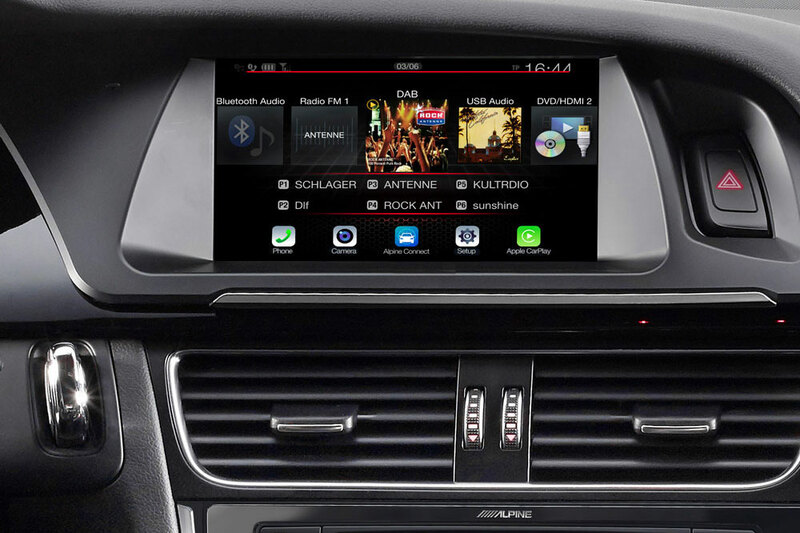 Product information "Navigation System Premium Infotainment for Audi A4, A5"
7-inch premium second-generation infotainment system for Audi A4 / A5 (left-hand drive) with navigation system, Apple CarPlay and Android Auto support. The built-in iGo nextgen navigation system offers 3 years of free map updates and is now compatible with the Driver Information Display (DIS) to indicate turn-by-turn directions. All system components are designed to fit perfectly into existing installation locations and be fully integrated with the vehicle's electronic systems. The navigation system is compatible with original Radio Chorus, Concert or Symphony vehicles. The 17.8 cm touch-screen display with pin-sharp resolution allows the system to be fully operated via finger-slide and has the latest video technology for outstanding image quality, contrast and image resolution. 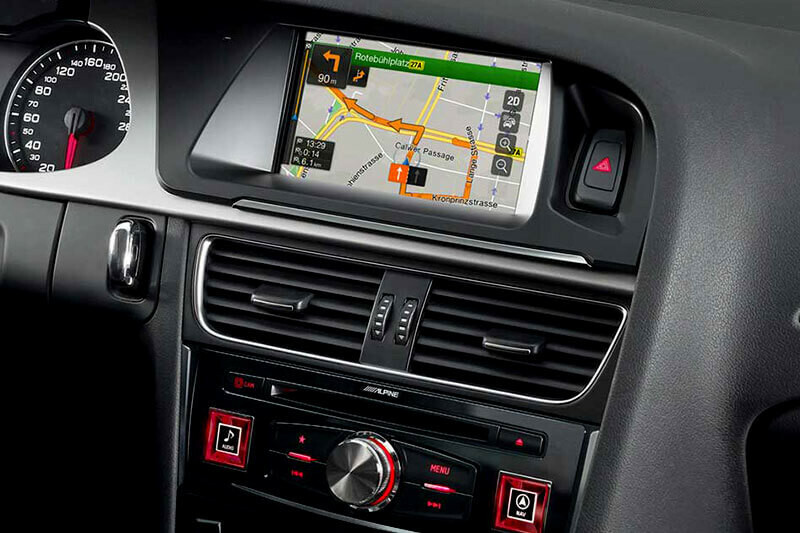 It displays navigation maps with stunning details and turns movies or video clips into a real movie experience. You will quickly appreciate the ease of use and ease of use of touch screen operation. The original Audi control is replaced by a special Alpine control that gives you direct access to audio sources, navigation, rear view camera and more. 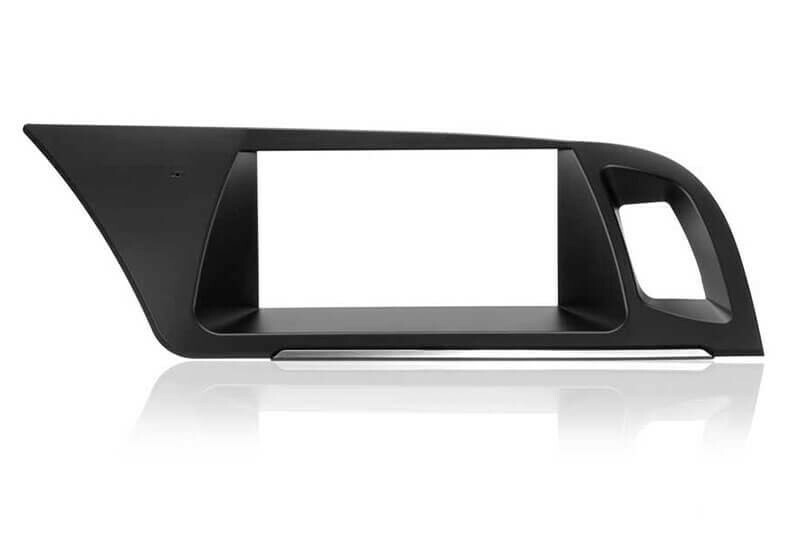 It's designed to fit seamlessly into the dashboard of your vehicle. With this infotainment system you can enjoy movies, music videos or TV programs from many different sources such as USB, DVDs with the optional optical drive, the latest smartphones with HDMI output or portable video devices (optional cables or adapters are required). Even video content from iPod or iPhone can be viewed on the high-resolution and 17.8 cm large display in perfect quality. For your own safety, video playback is only possible in park mode. 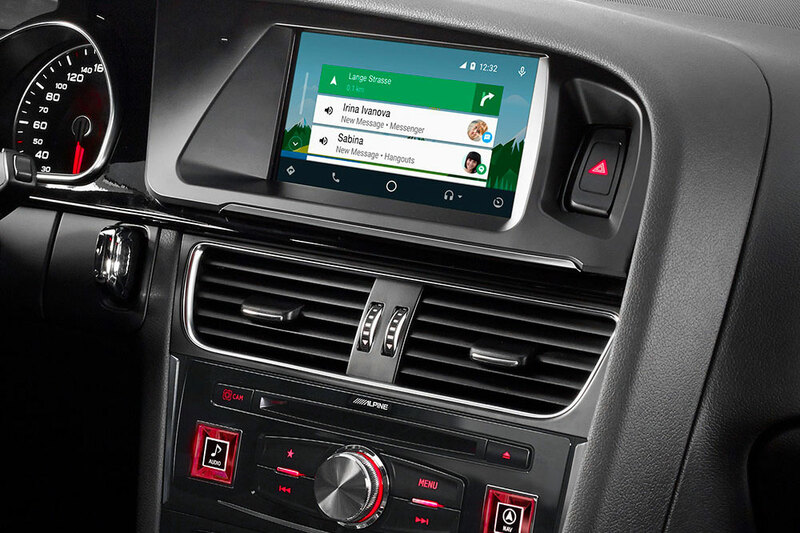 Use AppleCarPlay and Android Auto for more convenience. 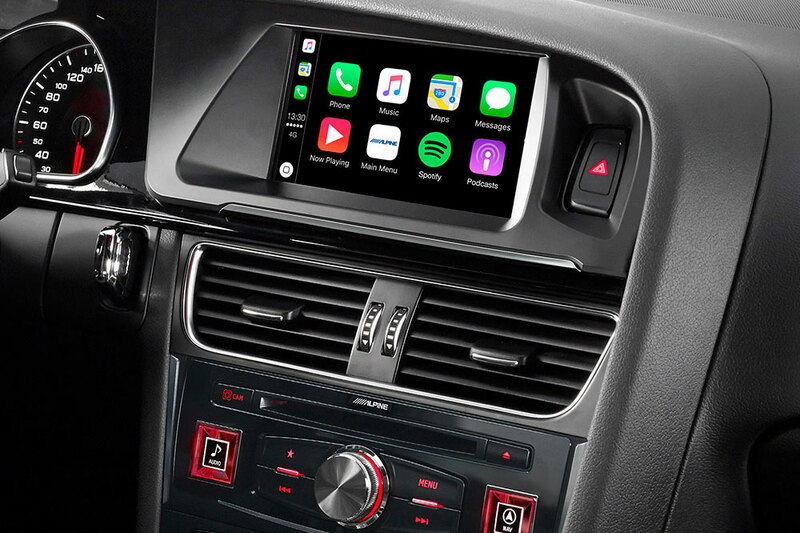 With Apple CarPlay, iPhone users have an incredibly intuitive solution on board to make calls, use maps, listen to music, and hear messages with just a single word or a touch of a button. You can enjoy Spotify, Internet radio or podcasts while still focusing on the road. Android Auto was designed especially for more road safety. With a simple and intuitive user interface, integrated steering wheel control and a new powerful voice control system, it is able to minimize distraction so you can continue to focus on driving. Android Auto automatically brings you useful information and easily organizes the best map views when needed. Radio reception with outstanding digital sound quality - that's what the integrated 1.5-channel DAB + tuner stands for, with its outstanding reception technology. It always gives you an extremely accurate, transparent sound. For uninterrupted reception, the tuner offers DAB + to DAB + Service Following, SLS (program-accompanying text information), Radio VIS (station cover on your radio display) and other helpful information. If there is no DAB + signal available, the unit automatically switches between DAB + and FM mode. Thanks to Bluetooth® compatibility, it is possible to establish a wireless connection to a Bluetooth®-enabled hands-free phone. It supports most Bluetooth® enabled mobile phones and gives you easy access to your phonebook with automatic updates and fast alphabetical search. A very intuitive user interface makes operation a breeze. Of course, you can stream music from your mobile phone and compatibility with AVRCP version 1.5 makes it even easier to browse your archives. In your Audi vehicle settings and warnings (such as oil level) are displayed on the main display. 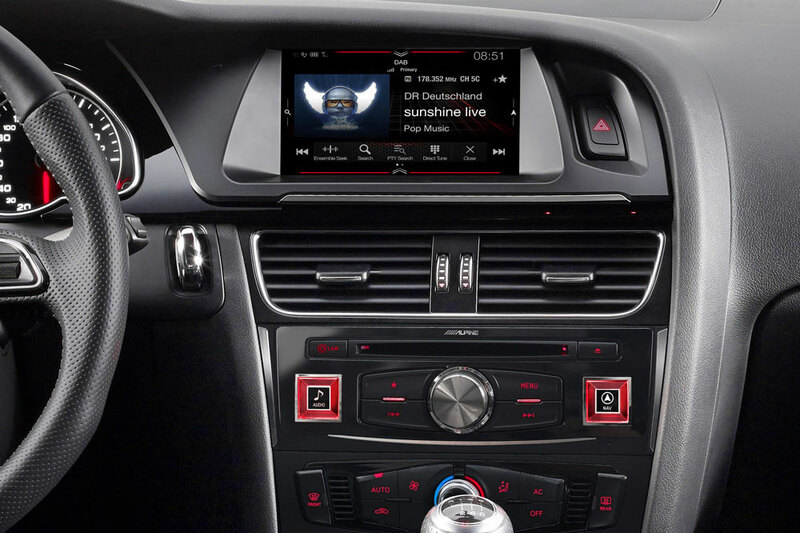 The infotainment system is fully compatible with the Audi electronics and therefore displays all menus and warnings. Many familiar graphic elements have been revised and modernized. Alpine has an excellent reputation for superior sound quality, and the infotainment system also shows why. Not only all electronic components are of the highest quality. 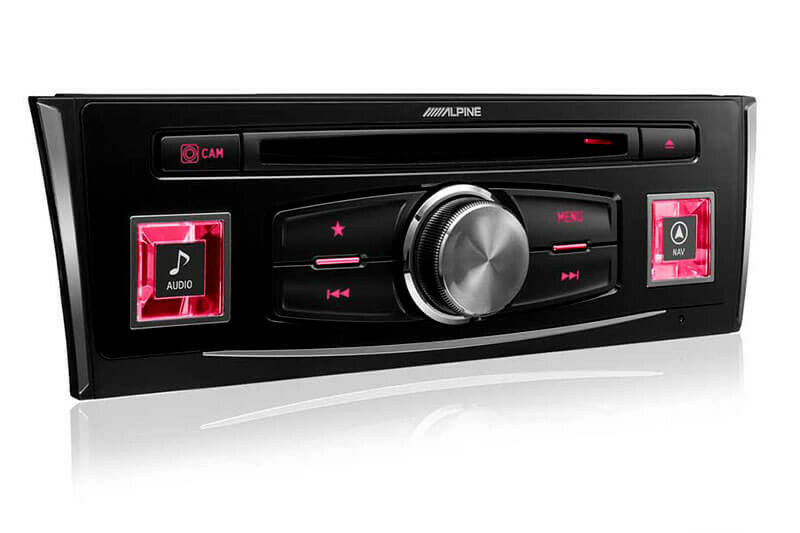 The entire system was optimally tuned to your Audi by Alpine audio engineers. For those who would like to perform their own sound tuning, there are numerous adjustment options available. These can even be set via the special Alpine TuneIt app very easily via smartphone. This Alpine system can play audio files in the high-resolution FLAC format - including 24/96 and 24/192 Hi-Res audio files. The iGo NextGen navigation software is currently one of the best on the market. 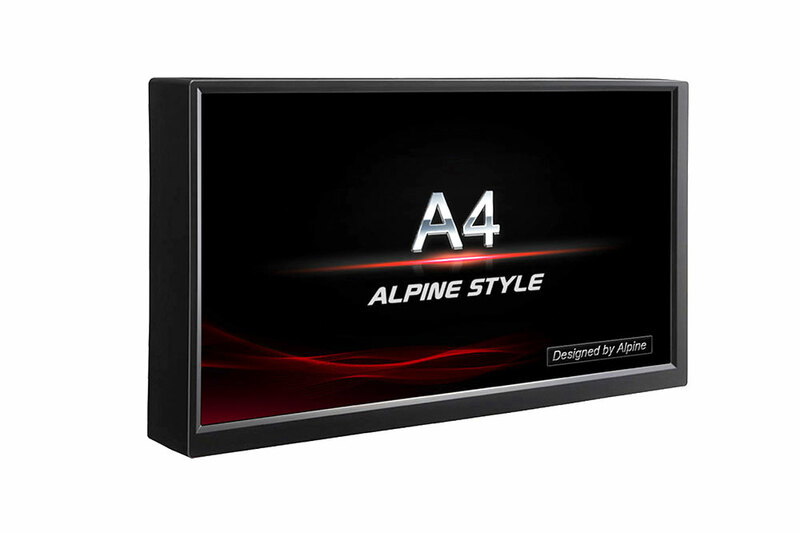 In combination with the high computing power of the Alpine Hardware, you get a high-precision and super-fast navigation system for your vehicle. For example, the calculation of a route from Munich to Paris takes only a few seconds. The system is equipped with many useful and unique navigation features: intuitive address entry with auto-complete, TMC route guidance, 3D symbols and much more. It also contains thousands of POIs, so restaurants and any kind of public places in your area can be found quickly. 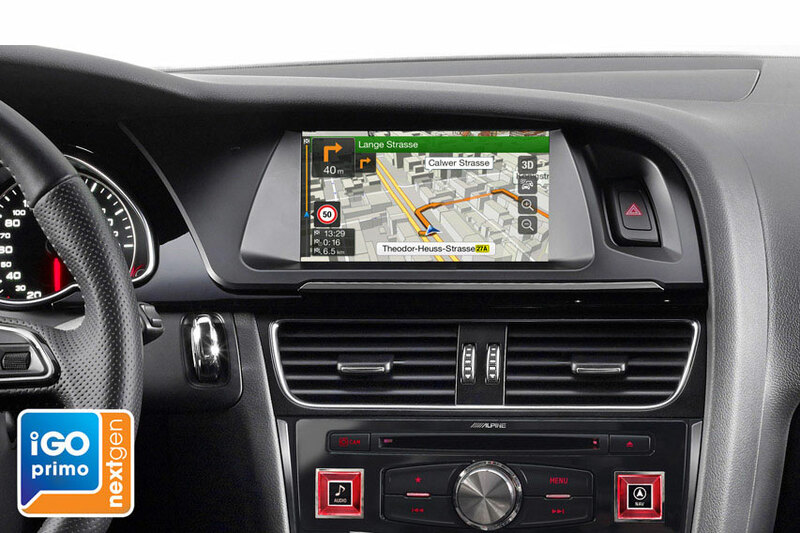 Customer review for "Navigation System Premium Infotainment for Audi A4, A5"
Properties: "Navigation System Premium Infotainment for Audi A4, A5"
Installation manuals for "Navigation System Premium Infotainment for Audi A4, A5"